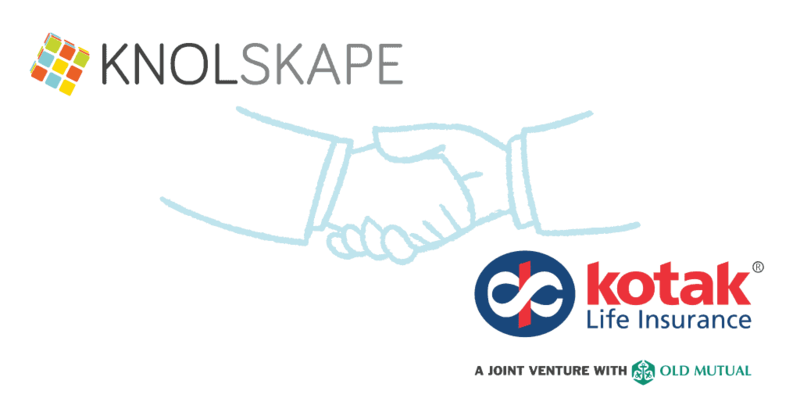 MUMBAI, India - Sept. 7, 2017 - PRLog -- KNOLSKAPE, a leading provider of Talent Transformation Solutions for the Modern Workplace, announced today an extended partnership with Kotak Mahindra Old Mutual Life Insurance Limited. After helping the organization improve employee capabilities and leadership skills at the junior and mid-manager levels, over the last two years, KNOLSKAPE now partners with Kotak Life Insurance to deliver a Leadership Mastery Series for senior leaders, in a top-down approach to learning, strengthening people management and leadership within the organization. Kotak Mahindra Old Mutual Life Insurance Limited, a private Life Insurance company in India, jointly owned by Kotak Mahindra group (India), and Old Mutual (South Africa), is focused on employing a holistic, and integrative approach to learning, to ensure that senior leaders and VPs enhance their leadership capabilities and provide the right level of supervision to their teams. According to Pranamika Kakati, AVP – L&D at Kotak, "KNOLSKAPE is our preferred partner for talent development. They are one of those vendors who provide a powerful and differentiated learning experience, contextualized for our business, and analytics with actionable insights on users. Managers observe significant needle movement in their teams' capabilities and performance after the simulation-driven interventions. As we were expanding our leadership programs across the organization, it was an easy decision to deepen our relationship with KNOLSKAPE." KNOLSKAPE's simulation driven workshop series will provide a holistic experience for the learners, in a safe learning environment, allowing VPs and other senior leaders to experience learning as their subordinates have gone through. The design also leverages bite-sized mobile learning, assessments to sustain learning retention, and manager surveys to indicate needle movement in performance. Thus far, KNOLSKAPE has successfully delivered transformative results to over 200 companies across 17 countries. "We are excited to partner with Kotak Life Insurance for development interventions across levels within the organization. We see it as a testament to the value we bring to the clients. Being tuned in to your team is the mark of a good leader, and Kotak Life Insurance' efforts towards actively empowering their leaders to do so makes us feel proud to partner with them," says Rajiv Jayaraman, Founder & CEO of KNOLSKAPE. KNOLSKAPE (https://www.knolskape.com/) provides talent transformation solutions for the Modern Workplace covering three key areas: Assessment, Development and Engagement. By leveraging experiential technologies, industry and business contextualization, and rich talent analytics, KNOLSKAPE helps accelerate learning, and transform employee experience to improve business performance. More than 200 clients in 17 countries have benefited from KNOLSKAPE's award-winning experiential solutions. Using artificial intelligence, business simulations, gamification, machines learning, mobile, and virtual reality, KNOLSKAPE delivers transformative experiences for the modern learner and the modern workplace. KNOLSKAPE is a 110+ strong team with offices in Singapore, India and the UAE, serving a rapidly growing global client base across industries such as banking and finance, consulting, IT, FMCG, retail, manufacturing, infrastructure, pharmaceuticals, engineering, auto, government and academia. KNOLSKAPE is a global Top 20 gamification company, recipient of Brandon Hall awards, and has been recognized as a company to watch for in the Talent Management Space, by Frost & Sullivan, and as a disruptor in the learning space, by Bersin by Deloitte.